India and Bangladesh on Monday took another major step towards strengthening bilateral cooperation by inaugurating new power and rail projects between the two countries. 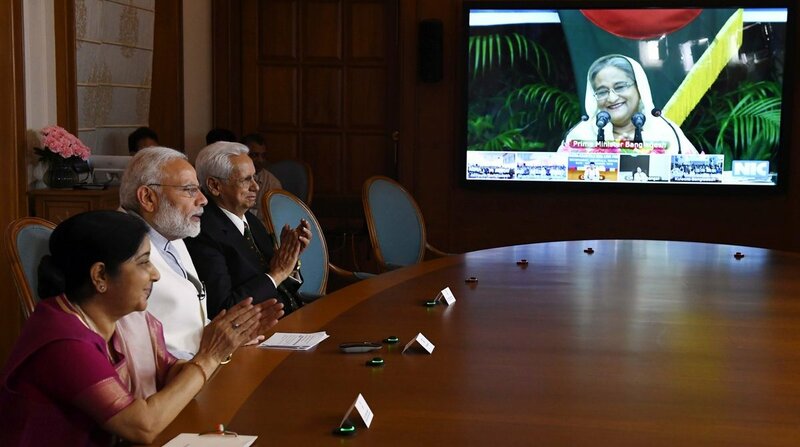 Prime Minister Narendra Modi, Bangladesh Prime Minister Sheikh Hasina, West Bengal Chief Minister Mamata Banerjee, and Tripura Chief Minister Biplab Kumar Deb jointly inaugurated three projects in Bangladesh, via video conference. External Affairs Minister Sushma Swaraj and her Bangladesh counterpart also joined the video conference from New Delhi and Dhaka respectively. The projects are: 500 MW additional power supply from India to Bangladesh through the existing Bheramara (Bangladesh) – Baharampur (India) interconnection, Akhaura – Agartala rail link and rehabilitation of the Kulaura-Shahbazpur section of Bangladesh Railways. Speaking on the occasion, Modi recalled that he had met Sheikh Hasina several times in the recent past, including at the BIMSTEC meeting in Kathmandu, in Shanti Niketan, and during the Commonwealth Summit in London. He reiterated his view that leaders of neighbouring countries should have a relationship like neighbours, talking and visiting frequently, without getting bogged down by protocol. He said this closeness was evident in the frequent interactions between him and the Bangladesh PM. Modi also referred to Sheikh Hasina’s vision of restoring connectivity to the way it was before 1965. He said he was happy that in the last few years, there has been a steady progress towards this goal. ‘’Today we have increased our power connectivity, and started two projects to increase our railway connectivity,’’ he added. He recalled that during his visit to Bangladesh in 2015, it had been decided to supply an additional 500 MW power to Bangladesh. He said this was being done using the transmission link between West Bengal and Bangladesh and thanked the West Bengal CM for her facilitation in completion of this work. Modi said that with the completion of this project, 1.16 Gigawatts of power was now being supplied from India to Bangladesh. He said this journey from Megawatts to Gigawatts was symbolic of a golden era in the relations between India and Bangladesh. The PM said the Akhaura-Agartala rail connectivity would provide another link in the cross-border connectivity between the two countries. He thanked the Tripura CM for his facilitation in completion of this work. He also praised Sheikh Hasina’s development goals of transforming Bangladesh into a middle-income country by 2021, and a developed country by 2041. He said that closer relations and people-to-people links between the two countries would take development and prosperity to new heights.